Captain Cooks Casino is run on Microgaming online casino software, and is a member of the Casino Rewards group. Captain Cooks online casino is licensed by the Kahnawake Gaming Commission in Canada. The online casino has been granted the eCOGRA Safe and Fair seal of approval, and has its percentage payouts audited and reviewed by independent auditors. The Welcome Bonus is a whopping $475 that can be used for one hour of play at the online casino. There are many different banking options and currencies offered, and players can choose from more than 10 languages to play in. Customer support is offered on a 24 hour basis. This online casino does not accept players from the United States. Security: Captain Cooks Casino uses the standard and secure 128-bit SSL data encryption technology to ensure that personal and banking information is kept confidential. Players each have a password and an account number in order to enter the online casino. $€475 bonus on your next 4 deposits! 1st deposit: Deposit €5 GET 100 chances to become an instant millionaire!! 2nd deposit offering a 100% bonus up to $100 free! 3rd deposit with a 50% bonus with up to $150 free! 4th deposit with a 25% bonus with up to $125 free! 5th deposit with a 100% bonus with up to $100 free! $100 chances to become an instant millionaire for $€5 ! On your first deposit of €5, you’ll receive 100 chances to use on Mega Moolah progressive jackpot game. This is an amazing opportunity for you to discover one of the greatest games, have a shot at winning the multi-million dollar jackpot or discover the many games available at Captain Cooks Casino! 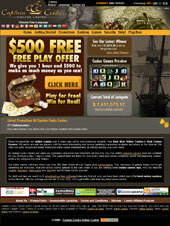 Captain Cooks online casino is part of the Casino Rewards group of online casinos. When players earn VIP loyalty points, at one dollar’s worth of chips for every 100 points, they an redeem the points either at Captiain Cooks Casino, or at any other online casino that also offers the Casino Rewards program. Players can download the casino software for ease of use. The Captain Cooks online casino software is provided by Microgaming. There are more than 458 games offered at Captain Cooks Casino, including slots, roulette, blackjack, video poker and more. Players can try out games for free in order to decide which games they prefer to play. The online casino is available in many different languages, including English, German, Italian, Japanese, Dutch, French, Swedish, and more. Captain Cooks Casino aims to provide its players with an easy and hassle free way to deposit and withdraw funds from the online casino. Players can choose to play in the British Pound, the Euro, American Dollars and Canadian Dollars. Captain Cooks online casino offers online customer support via their 24/7 Support Center. Players can contact the casino via toll free telephone or email 24 hours a day, 7 days a week. Those who are unable to call may send their telephone numbers to the support center via email, and a representative will call back. Casino reviews are often taken for granted by online gamblers, coz they consider them insignificant for their gambling needs. Most of the time, a high mounting sign up bonus has several hidden conditions which are almost impossible to meet by any new player, and online reviews is the only way to judge if a condition is practically achievable or not. So, take casino reviews as your online advisory before you place your first online bet!